Most rear-end collisions are entirely preventable with proper training and safe driving. In order to avoid rear-end collisions, truck drivers need to understand stopping distances. Stopping distance” is simply the distance necessary to bring a heavy truck to a complete stop. The distance it takes to stop an 80,000-pound tractor-trailer at 65 mph is much greater than the distance needed to stop a passenger car at the same speed. needs a distance of nearly two football fields to stop. What affects a semi truck’s stopping distance? 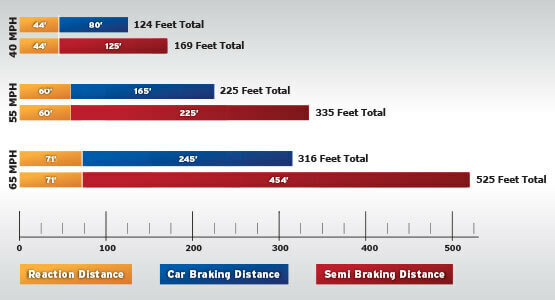 There are many factors that must be taken into consideration in order to determine stopping distances. 3) The road and weather conditions. Obviously, it takes longer for a semi-truck to stop on a wet or icy road. The larger the truck and heavier the load, the more time it will take to stop. 4) The speed and rate of travel. As speed increases, so does the stopping distance. 5). The following distance. The less space tractor-trailers have from the vehicles ahead, the less space they have to stop without causing rear-end collisions. What do you consider a safe following distance? For semi-trucks, it starts with a safe stopping distance: perception + reaction + braking. Originally posted 10-28-11, this post has been updated with additional information. Please note that most rear-end collisions are not “accidents”; they are predictable, preventable crashes. 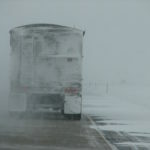 That’s why we use the word “collision” instead of “accident” in this post and others on TruckingWatchdog.com.